I did my basic Google research to get insight about what to expect before heading over to Ireland. The Republic of Ireland has very limited (or no) cycling information. Northern Ireland, part of the UK, is more clear with detailed maps and paths. Leave GPS and cue sheets at home: none of the streets, including major roads, carry their street names anyway. A compass might be more useful. Look at Google or an old-fashioned printed map before you head out. Write down all the small towns on your route. The road signs do indicate the direction of the next town over. You can find them if you know those names. You may not arrive as planned, (see No. 1) but you get there and may find new and unexpected scenic routes. Bigger towns are not indicated until you are getting close. Do not trust Google Maps or the distance listed to get the correct mileage. It’s better to plan for a shorter trip because you may have to ride an additional 10 to 20 miles. Invest in good rain gear! I love my Showerpass jacket and pants. They are expensive and work well. Leave your fancy road bike at home. The roads are crappy and your behind will hurt at the end of the day. The roads are mostly just slightly better than freshly grated streets or compacted gravel. There are not that many bicycle shops, but I also did not seek them out. Make sure you have the basic tools and knowledge to fix your bike. I am in love with zipties. If you lose a screw or component, they are definitely the way to go. Take your lights (head and tail) with you: the roads are narroooooooow! I was happy that I had my tail light with me (nice and bright) because I needed to be more visible. Cars drive past you at 60 to 100 kph and it might be good to be seen. Forget making a cycling fashion statement: I love black cycling gear and panniers. In Ireland, safety should be first (see No. 7): Jamie has bright red panniers and my outfits are bright neon colors. Ireland has a tons of free WIFI hotspots. The speed is super slow, though, and might be spotty. It works for basic emails and communication, but do not count to upload photos to Facebook in hostels or B&Bs. Trains and buses provide WIFI (limited and SLOOOOOW), but do not support Chrome. Irish rail and buses: yes, they do take your bicycles (up to three bicycles per bus/train). The train online reservation system for bicycles does NOT work. Go to the train station to buy the appropriate bicycle ticket. However, you want to buy your ticket online or be prepared to pay double at the station. In the main season you may run into an over-booked bicycle situation. I would check that out in advance to make sure that you get your bicycle on the train and bus. Getting there by plane: check out the various carriers (call them) to find out the current bicycle policies and restrictions for weight and box measurements. Aer Lingus and Air Canada include a bicycle as the one free checked bag. Be aware that Aer Lingus has a max of three bicycles per flight policy. Ireland is expensive: nothing is cheap, including the whiskey. An exception might be a pint of Guinness. Hostel, airbnb, B&Bs and hotel accommodations range from 18 to 200 euros per night. A B&B for one person is about 40 to 50 euros and a hotel about 80 euros. A basic pub meal runs from 7 euros (village) to 15 euros, while a restaurant is 25 euros (not including any drinks). A save estimation is about 100 euros per day. Keep in mind that all Irish have said that it is now much cheaper than it used to be when the economy was booming. If you want to save money (good luck with that), eating helps. Most airbnb.com hosts have allowed me to cook my own food and the hostels have nice clean kitchens. As a last note: keep in mind you can never really get lost in Ireland. In my experience, the people are very friendly and helpful. They will tell you several times how to go and where to find some good whiskeys. And if you are lost or had enough of the cycling in the rain, just stop at a pub, chat up some people, enjoy a whiskey, Guinness or Irish Coffee and stay the night. What made my evening in Dublin was the cab driver who brought me back to the local train station from Grafton Street. The real Irish cab driver (apparently, it is even hard to find Irish cab drivers in Dublin) and I had a lovely chat about the current Irish economic situation. I the same notion from him as I got from the lads at the Grasshopper - that many Irish are suffering at the moment. We had one these I-look-into-the-back-mirror-while-I-am-driving conversations. I asked him how people got by with the high prices and how do average salaries compare. "The tax rate makes it very hard," he explained. "Everything is taxed and, after you are taxed, you are taxed again. They want to get the economy rolling with additional taxes, but one can barely makes ends meet. Ireland is the cheapest country in Europe to buy a car, but after the taxes it is the most expensive place." "A few years ago a comedian based his show on what he called 'My government first loves me and then hates me.' It was about how cheap things were before he drove his new car off the lot and then got taxed and had to pay for tolls." "How high are your taxes overall?" I asked him. "Well it depends. Between 0 and 23 percent depending on the goods. The essentials are 0 percent, basics 13 percent and luxury items are 23 percent." "Overall maybe 50 percent?" I asked, to which he answered -"Yes, or higher!" I have not been able to verify the taxes. It would explain a hell of a lot though. How can the economy recover when decreased disposable income leads to less spending, huring the money multiplier. The travel costs remain very high (although they are very low at the moment), which depresses the the tourism industry. Since the crash, real estate lost 30 to 50 percent of its value. The Irish are hoping the economy will recover. Dublin seems to be leading the way with Google having a major location and Airbnb.com opening its new European headquarters there. I had plenty of time to study the facial expressions of the politicians on the posters garnishing the roads. The Sein Fein representatives looked very cold the farther north I cycled. Fine Gael representatives smiled. I did not know about their politics. Sein Fein is the party people either "love or hate." Some may want to give them a chance, while others despise them for their support of the IRA. They are gaining more strength with the recent election. Radicals always flourish when an economy is depressed. There is a strong influx of Eastern European and Chinese. Every small village has a Chinese take away (not take out - that is American English). Reports mention that the Eastern Europeans work cheaply, making it difficult for the Irish to find a job. One old Irish man told me that just 20 years ago there were nothing but Irish in Ireland. And now the new foreigners are lazy and collecting dole (unemployment benefits). Meanwhile, the hard-working Irish are struggling. Heavy hearted and concerned, I am leaving to my accommodations for the night. I left Belfast via train to Portadown shortening my cycling trip by one day. The initial plan was to cycle to Dundalk, then Drogheda and arrive in Dublin Sunday night. I wanted to leave on the evening train to Shannon. I changed my route when I could not find any night accommodations in Dundalk. I would still be in Northern Ireland (NI) at the start and cross over into the Republic. NI is very cyclist friendly with a numbered path system. In Portadown I caught route No. 9, which runs along a canal and is restricted to cyclists and pedestrians. A perfect path for a leisurely bike ride on a sunny Sunday afternoon (yes, that was a Freddie Mercury reference). The difference in the landscape between Northern Ireland and the Republic is subtle, but striking. In NI the landscape and lawns are well-manicured and most of the land is enclosed with big, sharp, metallic, pointy fences and gates. Even the sheep and cows look less fluffy, skinnier and well-groomed. The demeanor and humor of the people also is more direct. It's a little less entertaining than the wittiness found in the suburbia of Connemara and Dublin. Dublin - is it what I imagined? I finally arrived in the suburbs of Dublin after going 93 miles during two rainy and dreary days. I dropped off Jamie at my airbnb.com before heading to town via the metro with the Rugby fans and women in stilettos. I wish I could say I'm blown away by Dublin because it was just how I have always imagined it: cute pubs, drunk witty locals discussing politics, traditional Irish music and a great night life. How can Dublin, though, compare to what I have experienced? I've seen Doolin's Fitzpatricks Pipeplayer on a Sunday night and places like Westport's Mat Malloys (although I could have skipped the hen parties and drunk bachelors). Even this morning's vivid conversation with some Irish lads about the recent election in Conlee's Grasshopper (very cute pub), just 12 miles outside of Dublin. After all of that Dublin felt cold and like a major shopping mall to me. Temple Bar was a miniature Times Square with a Hard Rock Cafe. Grafton Street had Starbucks and T.G.I Fridays on some corners and chain souvenir shops on others. I joked cynically with the souvenir shop clerk about whether or not the wool socks I was about to buy were from Bangladeshi or real Irish sheep. "They might be Honduran sheep!" he answered. "It will be tough to find anything local produced in Dublin. In the small towns yes, but not here." Keep in mind when reading this that I do live in one of the biggest cities in the world. As a true New Yorker, it's hard for any city to compare to our town! Belfast: IRA, Catholics, Protestant and Bonfires. The brick wall was at least 45-feet tall, with chicken wire mounted on the top. The houses adjacent to the wall had wire cages installed to protect children from rocks that were still thrown over the fences. This was the separation of the Irish Catholic and the British Irish living quarters. It was election day and politicians who were once IRA or Unionist were up for city council to represent the Northern Irish government in London. Once killers, now politicians. In front to the polling station were party representatives handing out materials to persuade the voters. Loud speakers were playing recorded speeches. In the more Protestant neighborhoods, teenagers were collecting wood and burnable materials for the July 12 Orange Parade (http://en.m.wikipedia.org/wiki/The_Twelfth), which would be held in desolated construction zones and parks. The bonfires would be 10- to 15-feet tall and would burn for one week. It’s a celebration of the victory of the William of Orange over the Catholic king of James. Even if there are no secret handshakes and codes to distinguish the Protestants from the Catholics, I could not escape the feeling that the tension is still there. It has been politically sanitized, with workplace application processes that have forced a more balanced Catholic and Protestant ratio. Eight out of the 10 gates of the 45-foot walls are locked each night and secured with monitors. A police car passed me and it looked like a miniature tank. My cab driver told me that even those were not safe enough. I was staying for three nights at a small and private English language program. The owners Sonia and Gavin provide a live-in language English immersion program. At the moment there were three students present: Richie and Natty, a couple from Spain, and Nacho, who was entering university in the fall. They had classes in the morning, while I was exploring Belfast and the Giant Causeway. And if time permitted, I joined them for breakfast, lunch and dinner. Over the meals we bonded and talked about many topics, including advertising, Northern Irish politics, running, cycling and how the British and Irish differ. The slowly building familiarity between us was comforting after two weeks of daily changing faces, conversations and impressions. I was becoming aware that my journey was approaching its end. I would soon be leaving all my new friends and experiences behind. I had just two more days of cycling before I would head back to Shannon, pack up Jamie and start my journey back to New York. The coast of Northern Ireland unfolds in front of me as I ride, revealing the endless blue sea next to a manicured golf course, waves crashing against black rock formations and isolated clouds drifting by. In the distance I can see the foggy white outlines of the Scottish coast. I am cycling along the Causeway Coastal Road. Cars are rushing past me on the narrow road, likely heading to the Bushmills Distillery or Giant Causeway. I am leisurely making my way, stopping every few minutes to take photos of hidden beaches or rock formations - a miniature version of what I would later see at the Giant Causeway. The cars are going too fast to even notice. The weather was perfect with just a few clouds when I left Belfast via the Northern Ireland Railroad (NI) to Coleraine heading to Bushmills. I decided to see how I was feeling once I got to Bushmills, where I would either turn around or continue. I never really understood the difference between Scottish and irish whiskeys. I learned about the smoking of the barley before creating the mash. Scottish barley is dried over a wood fire (peaty) to create a smoky flavor, while Irish is dried over heat to keep the purity of the barley. My favorite Irish whiskey - the Connemara 12 - is the only peaty whiskey in Ireland. It’s dried over peach wood, giving its unique flavor. It was only 2 kilometers left to the Giant Causeway and I arrived late, around 3 or 4 p.m. A fair amount of tourists were parked in front of the Visitor Center, as well as a few bicycles. Jamie was admired and thoroughly checked out by some of the tour guides. They even took a close look at her disc brakes, saddle and gearing. That seemed a bit intimate, but then again she is not hiding much! The Giant Causeway is stunning. The impact on a driving tourist must be overwhelming with the gigantic rocks and water. I was less impressed after having enjoyed private previews during my ride along the Coastal Road earlier. In the summer, the Causeway must be packed with tourists. The weather was too perfect, and the landscape too stunning to turn around. I continued on the Coastal Road up to the Ballycastle, and back inland to Ballymoney, hoping to catch the train. I was speeding, worried I would miss the 8:30 p.m. departure. I asked a man who was mowing his lawn in Ballymoney for directions. "Should you be cycling?" he asked me with a firm tone. I gave him a look of surprise. Was he worried about me cycling without lights at dusk? "Why do you ask - because it’s getting dark and I have no lights?" I asked. "No, you have been drinking all day!" he scolded me. "That was at noon and I had just one whiskey!" I replied. And how the hell did he know? I was cycling straight and might look a bit flushed from racing down the local narrow roads concerned about being caught in the darkness. Cars going 80 kph might not be able to see me in time to stop. "I saw you there earlier today,” he said. “I am just joking!" Returning a stressed-out smile, I got instructions and raced to the station. I missed the train by seven minutes. The last train was leaving in one hour and heading back to Belfast. Leaving Westport in the rain to Sligo … grrrr … a necessary evil. I was way over thinking it was romantic to cycle in the rain, but too proud to bus it. "Ninety-nine kilometers could not be too bad," I told myself. Shouldn't that be about 60 miles - a metric century? Didn’t someone mention that on a ride in NYC? At the beginning of my journey from Shannon to Ennis I saw three signs at a crossing pointing to three different directions with no indication as to where they might lead. A farmer passed me and stopped his truck up the road. He must have seen me in his side mirror taking a photo of the odd signs and fumbling with my map. I followed the big signs in the direction of Dublin on the N5, turning off on the N17 to Sligo. Screw the longer and more scenic coastal road - I just want to get to Sligo! The N5 had nice wide shoulders where I could safely ride next to the "heavy traffic." I was fed up enough to count the kilometers to every town leading up to Sligo. It read "7km to Swinford.” I kept on pushing my bike up and suddenly it is 8 kilometers to Swinford, then around the curve 3 kilometers. The distances kept changing throughout the trip. Ultimately I relied on my odometer to give me a closer reading. Memorials and Yearning for Luxury. The landscape changed from the short Connemara scrubs and mountains to gentle sloping hills with lush green grass. The trees were abundant, shortish and with branch-heavy crowns. There were plenty of cows and a few sheep. 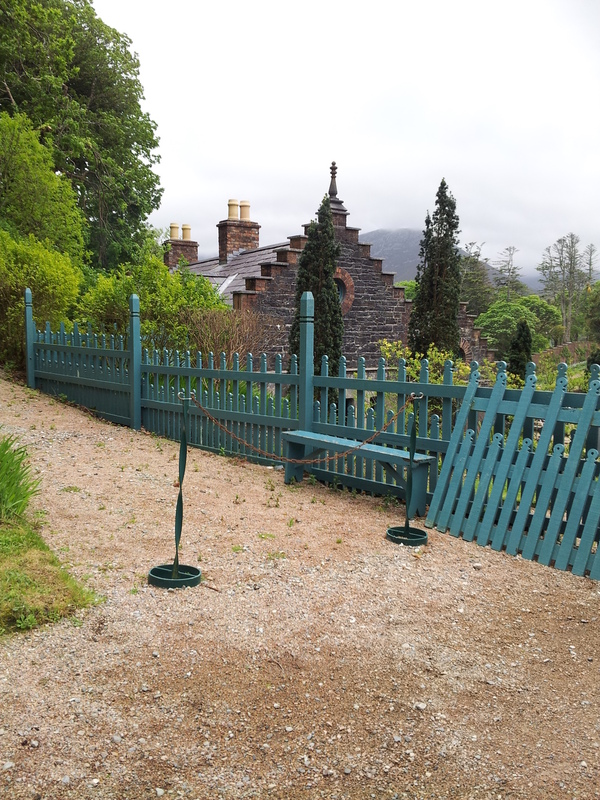 Stone walls and fences delineated the properties. Reaching my exhaustion limit at 62 miles with 10 more to go, I stopped to have snack at a limestone statue. Not wearing my glasses, I had to get close to read that it was a memorial for a young boy who died of the age of 2 at this crossing. His name was Patrick Moran, born on May 21, 1977, and died on May 15, 1979. Today's date was May 19, 2014 and I was born 16 days before him on May 4, 1977. He would have been my age. 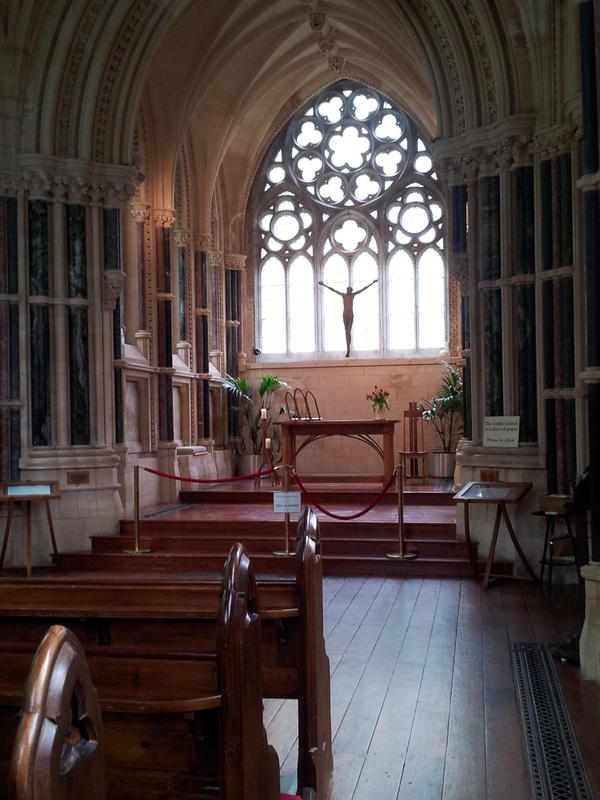 It was airy after having talked to Genieve about Irish superstition and Celtic tradition. I left in deep thoughts and arrived in Sligo at 9:10 p.m. looking for shelter. I made reservations at a hostel, but could not yet bear the thought of sharing space. The Glass Hotel had one room left and after dinner I enjoyed a warm bath and lying in the over-sized bed with WIFI watching Shawshank Redemption. Rain - love or hate It. It was 35 to 40 miles to Westport. Steven, from the Monastery Hostel, advised me to take the scenic routes and told me where I could turn off from the main road. He has cycled almost across the world starting in California, down to South America, across Australia to Taiwan, until the Airline Qantas broke the fork of his bicycle and abruptly ended his tour. It was an overcast day and I put on my rain gear just in case. 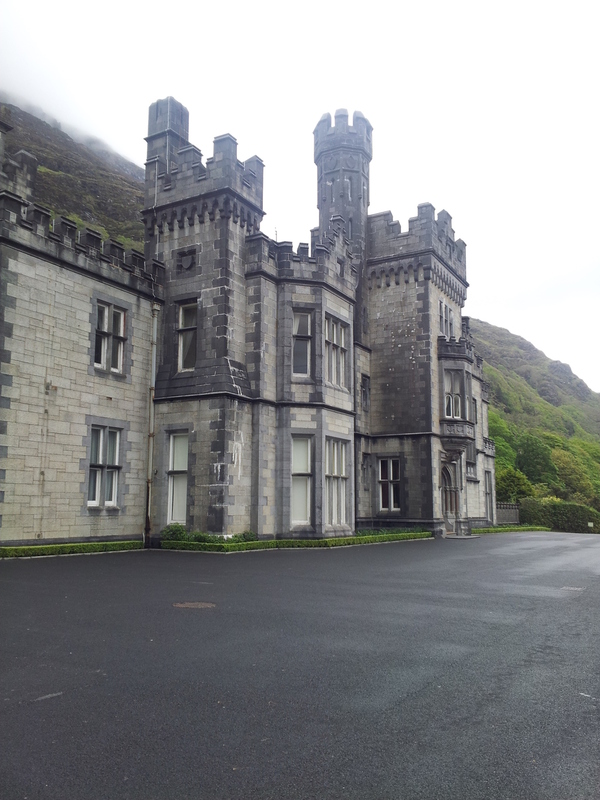 The 12 kilometers to Kylemore Abbey were dry with a strong tailwind. The rain came down around mile 15: a middle drizzle with wind that steadily increased. My bright yellow rain cover for my helmet blew off and into the open terrain. It started pouring and the mountain tops were covered in mist. My glasses fogged up and I needed to take them off, but Jamie was gliding at 17 to 19 mph with the rain smoothing out the rough street surface. Initially, it was romantic to ride in the rain, be a part of the elements and, in a way, experience Ireland uncensored. I got very hungry and there wasn’t a pub in sight. There wasn’t even a dry or covered spot to eat my packed lunch. Huddled in the driveway of a farm in the middle of the rain, I was chowed down on lunch. My body temperature dropped rapidly and I was shivering. I jumped back on my bike and pedaled as fast as I could to get my body temperature up. Being wet and cold is just a nasty feeling. I was so glad when I arrived in Westport and could take a hot shower. Westport, according to the Lonely Planet, has the liveliest music scene on the west coast. Mat Malloy's, THE Pub, was just a few blocks from my fabulous B&B rental. The Pub had two rooms: one for traditional music where musicians from all over the world would come together to jam (if that term applies to traditional Irish music) and a back room for modern music (popular music from the past 20 years). The traditional room was packed and the owner, Matt Malloy, who was probably in his 70s, played the flute along with a guitarist, fiddler and another flautist. The room was noisy with people chatting. The musicians were leaning over their instruments, trying to hear their own notes. A bachelor party with several Irish guys and two young couples from Seattle were topping each other. The lads were competing to see who could down a beer the fastest. At one point, the bald, red-bearded guitarist stood up and yelled: "Lads-the hens are in the back. Can't you take it there?" There were tons of "hens" at the Pub. They were wearing super-short skirts and dresses, as well as really deep-cut decolletes. They were decked out with layers of makeup and flashy jewelry. It reminded me of a comment Peter made years ago when he got back from a business trip to London: "Nothing was left to the imagination including the look of the thong." They felt out of place in their surroundings. The rustic Pub had old wooden benches and casual decor. The most colorful elements were probably the different liquor bottles behind the bar. Most guys were dressed in comfortable jeans and maybe dress shirts - the hens stuck out like a sore thumb. I was sitting next to a British guy, Tom, who was living close to London. His mum was originally from Connemara and they were celebrating her birthday back home. His younger brother Martin moved back a few years ago. It is hard not to fall in love with Connemara and Westport. The landscape is just stunning and the people are very warm and accepting. One thing I noticed today: No Irish have asked me about my heritage or where I am from. The only people who opened the conversations wondering about my ethnicity were Americans. One was in disbelief that I am from New York, while the other focused on whether I am Chinese, Japanese or Korean. I just answered: "Does it matter?" Whiskeys for today: Jameson (it is pretty smooth, but nothing exciting) and Black Bush (nice, but I am still a fan of the Connemara 12 and the Yellow Spot). Today would be sort of a resting day. By mid-day I would be getting to the Aran Islands Isishmor in the County Galway. I hoped to get in a nap after two long nights atthe Pub. I was shivering on my way over, wearing skimpy cycling pants and my Izumi late fall jacket. The wind was strong (nothing new at this point) and with no sun the it felt like little daggers on my skin. As we were passing the ferry Inishman, the smallest and first of the three islands, thesky broke and the sun lit up one of the small houses like a spotlight. It reminded me of the British Romantic Painters who were known for the mystical and sublime light quality of their paintings. I have never seen such a contrast of light mixed with such a variety of saturated green and blue colors from the sea and grass. For the first time, I think I felt inspiration similar to what the painters experience. The Irish are very quick-witted and love to banter. So far, I have not found an local who is straight-laced and can't get a chuckle from just about any thought. My small ferry was named the "Happy Hocker - Dublin." On my way on to land, I looked at the captain and asked him, "Are the Hockers in Galway not as happy as the ones in Dublin?" He smiled back and his second mate said, "No, the recession hit them too hard!" I was looking for a pub and an Irish Coffee to get over my shakes. The best of two worlds: coffee and whiskey. And it would make the coffee actually tasty. The Irish cannot brew any decent coffee. "The Bar" was the one of the two open places upon my arrival. As I walked in, two older men were sitting at the bar. Pat was at the end resting his back against the wall with a pint of Guiness. The other man's back faced and partially hid my view of Pat. I heard a well-spoken voice calling out with firm conviction: "Do you play chess?" I looked at Pat. I guessed he was in his late 60s and I noticed his withered skin that looked very soft soft compared to the farmer's outdoor leathering texture. His bright blue eyes were looking at me waiting for a reaction. I am always amazed at how much the eyes tell about a person. They are often ageless. A young person may have lost the spark already, while other people will have it until they are on their death bed. He was the latter type. I put my panniers down, took off my coats and replied while sitting down on a table across the bar from him: "Later tonight if you are here and I am not that good anymore." Later in the conversation, he told me that he challenged all strangers walking into the bar with this question. He also said he has had the pleasure of meeting lots of world champions and other good chess players in Inishmor. "They all come here," he said. "I never have to go anywhere." Two women walked in shortly after me. They were best friends and now enjoy traveling together since their kids are grown. One was from Montana and the other from Scotland. Pat asked them: "What do you do?" "We own a farm and raise their cattle and heritage turkey," they replied. Pat waived his hand as if he wanted to brush them away and said in a nonchalant way: "I am already boooored" while he was drawing out the "o" in bored to emphasize his disinterest. She was taken back by his reaction for a moment and wasn't sure how to respond. I jumped into the conversation, thanking her for her work since it is so tough in the United States to get humanely raised meat. We continued complaining about the feeding lots in Nebraska and the lack of knowledge about meat. Pat was listening. I turned and looked at him almost apologetically: "In Ireland you can assume that you have humanely and farm-raised meats. In the United States this is rare and very expensive." If he was surprised, he did not show any changes in his demeanor. The other guy who has been quiet so far, nodded in agreement: "It is like our ham at the butchers. They used to raise all their animals in the backyard and now it is all pre-packaged." The bartender walked up to the man who just spoke and asked him if he would like another Guinness. He nodded and Pat looked at the bartender: "And you are not asking me?" The young woman, who had her long, dark hair tied in a ponytail, looked at him and waved her hand: "Oh, I know you are having another one, Pat!" She poured another round of Guinness for the "boys." "So, what did you do before you retired?" I said shifting the inquisition-style conversation. "Me? I was an electrical engineer, but have been retired for the last 10 years," Pat said. "Now, I work with Windows 8 and am loving it!" "Well, since you were an electrical engineer it must have been fascinating for you to have seen how the motherboards in the computers have changed and how tiny the circuits are now," I said to Pat. "It is a rapidly changing field." I sparked his curiosity with that comment. Pat looked at me straight on - across the room where I was having a full Irish breakfast. Pat and I became engulfed in a long technical conversation about motherboards, circuit systems and operating platforms. I loved watching him over the course of the next hour as he lit up and passionately shared how he got involved with Windows XP, Vista and the new Windows 8. In those moments, he was like a young boy who just found another toy that captured his imagination. Life has not beaten him. The spirit of who he has always been is still strong. I stored my belongings at the hostel before I took off for a short ride on the island and hiked up the Black Fort (Dun Duchathair). 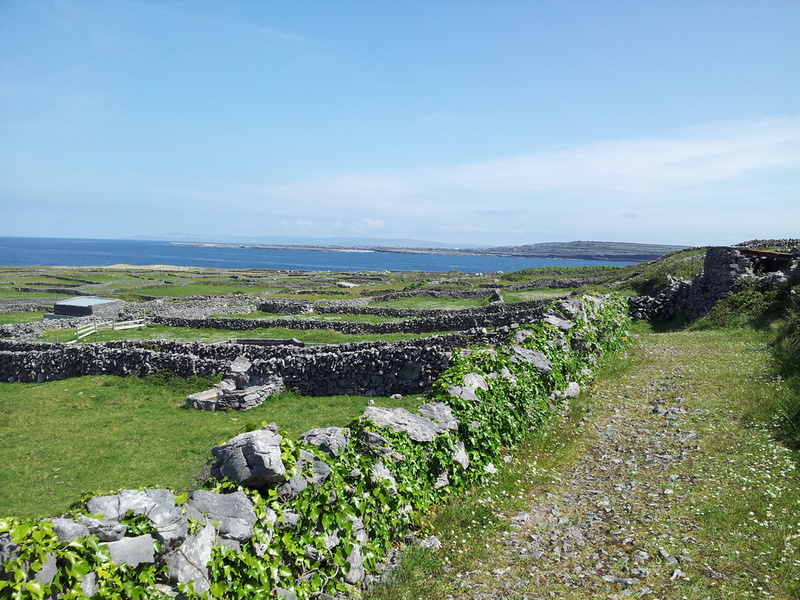 It is a stunning island with beaches, the over-priced tourist attraction of the Celtic ruins (Dun Aengus), tourist shops and cafes. Jamie chain was purring up the hills past other cyclists topping out at 20 mph at times. I remained in deep thoughts about passion and life for the rest of the day. Note: No whiskey tasting tonight. I called it an early night. "The ferry leaves at 9:15 a.m. I should have plenty of time," I said as I was standing in the hostel's kitchen thinking about frying some pork sausages. That's when the keeper, a youngish skinny Irishman with a wicked sense of humor said, "No, it leaves at 9 a.m.! I just rescued you!" He grinned under his black-rimmed glasses. Instantly in a panic, I grabbed the uncooked sausages and my heavy cream, then ran off to get Jamie loaded and speed-cycled to the pier. When I got there, I discovered that the ferry did leave at 9:15 a.m.! It was a beautiful sunny day with a mild breeze and a few clouds in the sky. Upon arrival on the mainland, I tried to use my phone to access RidewithGPS, but the signal was too weak for me to pull up all of my fancy pre-planned cue sheets. I asked two men who were working the gates to the ferry how to get to Clifden, which was the next major town before my final destination today - Letterfrack. A bit stunned and maybe amused at seeing me with all these non-functioning gadgets, they pointed me in the right direction and told me which small-town signs to watch out for on the way to Clifden. For the first time, I had side wind for most of my ride. There was the occasional fierce and hated head wind, too, but nothing compared to the last few days. To my relief and overcoming self-doubt about my performance I finally got up to a steady 14-16 mph with Jamie. The last days felt so self-defeating when I averaged all of 6-9 mph. Riding past little creeks and cascades that emerged suddenly between the vast grass fields, I turned at an up-sloping curve and saw wind-blown trees hovering over a tiny creek. At the tree trunks on moss-covered ground were white- and black-checkered baby lambs and sheep resting. It was like a picture in of one those sickening postcards of a perfect idyllic world. All what was missing was a Leprechaun peeking in behind a sheep. I arrived around 6 p.m. in Letterfrack after about 40 miles and a 2,400-foot climb. On my way to the hostel, I ran into Cloe, who I shared my dorm with in Doolin. Freddie and Katrin from Germany had arrived two days ago and also were expecting me. It was nice to see familiar faces. After dinner I was really too tired to head out to check out the local pub scene. Fearing I would miss out on some good music, I made myself an espresso before Cloe and I headed out. It would have been delicious with some heavy cream, but when I opened my bottle of heavy cream I found whipped cream instead! Apparently, the bike movement beat the heavy cream into "Schlag." Note: Whiskey of choice: Crest 12...smoooooth!!! I walked into the Fitz across the river from the Allied River Hostel after I finished my last blog about Doolin. Adva, Robert's wife, mentioned to me that she would be singing later that night. They were the keepers of the hostel and over the course of my stay I started feeling close to them. My favorite writing spot was a sitting area by the window at the entrance of the hostel. It was just across from the small reception area where Robert was welcoming and advising guests. After the coming and going of guests slowed down, we had a witty exchange and shared personal stories. The Fitz is a more modern pub than O'Connors, with bright new oak benches and the woodwork was much larger. Adva saved me a spot at her table where she was sitting with two other Germans: one was traveling, the other was working at the hostel. The bagpiper (a side pipe apparently) finished explaining the history of his pipe that was invented in Philadelphia. Then he started playing, stomping his foot in rhythm with a forceful look in his bright blue eyes, losing himself in the rhythm. I am not sure what was more fascinating to me: the music itself or seeing his passion for the music. The banjo player joined in. Adva was asked during a break to sing with the banjo player. She has beautiful light brown curly hair that frames her face. It fell down softly in front of her shoulders when she sat down next to him. People were still chatting when she started to sing. She has a very soulful, dark and warm voice that carried me away into the yearning and pain of the story. The audience hushed each other to be silent until her voice took over the room. I ended the night talking to my fellow German world traveller. After a few too many whiskeys (I am seeing a pattern developing) we talked about the meaning of life. She was 27 and reminded me a lot of myself at that age. "To make enough money to make an ends, explore the world, and enjoy the small things in life each day, such as the sunshine!" By now I decided to try each Irish whiskey. My favorite so far is the Connemara 12, followed by the Yellow Spot 12, Redbreast 12 and Green Spot. Thumbs down for Jameson. In Ennistymon I decided to try out a hostel after an expensive and disappointing meal at the Falling River Hotel. I could not imagine eating more steamed and bland-tasting carrots and broccoli. Hostels would apparently give me flexibility to cook my own meals. The Lonely Planet Ireland recommended the Allied River Hostel for Doolin. The hostel is located just across the stream and has some lovely sitting areas outside. One could sit just at the river or have a meal on the table outside. Past the reception area is the dining room with old wooden chairs, benches and big, long rustic tables. There was also a fireplace where many of the travelers would sit to relax, read and play games. The kitchen was just off to the right with large refrigerators, as well as several cooking stations and sinks. It had a homey, pristine and clean feeling. The fellow travelers were from all paths of life: there were professionals like a doctor, students, families and global trotters of all ages. Most of the time guests were very respectful of space, including in the dormitory. It was not "another population" or just "loud students ready to party." I may just continue to stay in hostels until the end of my trip. There was a steep hill on the road just after the Cliff of Manor. I struggled on this seemingly endless climb when the road turned unexpectedly and revealed a panoramic view of the sea and valley. The landscape was now covered with a few patches of green between the limestone. The waves were high, thrusting against the cliffs, covering the edges in white foam. I arrived in Doolin, a small fisherman's town by the sea, later than expected. The 20-mile ride from Ennistymon took four hours with the climbs, added weight and the non­-stop blowing headwind.The hostel was just outside town center. The main street in Doolin, Fisherman Street, may have at most 15 buildings, including the famous O'Connors Pub, a restaurant, gift store, chocolate store and several B&Bs. The tourist buses were lining the other side of the street across from the Pub O'Connors. 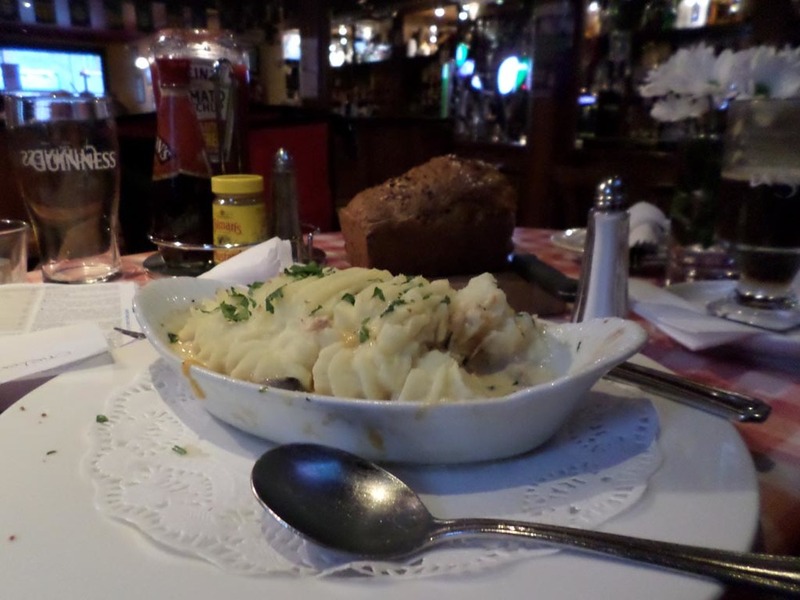 I walked into Pub around 10 p.m. hoping to find out if it would hold up to its reputation for traditional Irish music. Around the corner of the L­-shaped wooden bar were 3­4 older gentlemen sitting in the middle on a table with a flute, accordion and violin. Most of the people in the audience appeared to be tourists. They were sitting on small wooden stools and tables surrounding the musicians, drinking Guinness and taking photos. A few locals were sitting at the bar, including Ted and Jon, who would be singing throughout the night. They were around the corner out of view of most people until the flutist waved over to Jon, who emerged from the background to share a ballad in a quiet and husky voice. Ted took turns with Jon and had a stronger voice with a dark pitch. In the dim light of the rustic Pub and after a few whiskeys, we all joined in the chorus. I wondered for those two hours how life must have been before industrialization and technology controlled our lives. Was the music preserved not just for tourists, but because it is a part of the Irish tradition? Now, I am in their shoes­ trying to find the right words. I left Doolin via the Coastal Road to Ballyvaughan via Fanor. The sea was to my left and inland to my right. The landscape was slated in grey lime­stone. Toward the sea, the limestone was broken into smaller rocks with occasional patches of grass and flowers trying to survive in the creases. The 20 to ­30-foot-tall rock beds were inland and in the near distance were hills made out of limestone. After Fanor, the road sloped downward and I was cycling along a narrow road in the shadow of a steep hill with a view of the bay. I was alone and felt so small compared to the magnificence of the elements. I hoped to stop by a Perfumeries in Carran on my way back to Doolin. The streets in Ireland are poorly labeled and, if there are signs, they are very confusing. I must have missed my turn­off again because I ended up in Lisdoonvarna instead, the only Spa town in Ireland. At this point, I have given up any hope of staying on my planned cue sheets. My T-Mobile GPS is inaccurate, the maps are not helpful and signs are pretty much useless. As long as I find my way home I will be happy. It was pouring when I sat down for breakfast looking over a green field with sheep. My B&B is a traditional Irish sheep farm and the son's owner is an avid amateur jockey. I looked over my paper map (shocking, I know) and decided I would make my way up to Doolin today. The 50-mile route seemed easy enough. I hand-wrote my cue sheet and started packing. As soon as I stepped outside, the rain suddenly stopped, but the sun did not break through the clouds. I was riding for the first time with front panniers (these are small bags attached to the front fork of the bicycle) and pedaling against strong winds. The wind was blowing so hard that I could barely hear cars even when they were just 30 yards away from me. The howling wind drowned out all other sounds. My front wheel felt wobbly on the compacted gravel road. I was initially not sure if the new panniers threw off my steering or the actual wheel got bent during the flight. Part of me wanted to ignore the issue, but I was worried about the long-term impact on the expensive wheel. If I had to replace it, a brand new wheel could cost several hundreds of dollars. I was about 12 kilometers away from Ennis, a larger town, and probably my last chance to find a bicycle shop before heading into Burren and continuing into Clifton and Westport. After that I would be traveling only through tiny villages with plenty of pubs. Ennis is a gorgeous fisherman’s town with a petite center. A narrow, one-way street would lead me up to the bike shop. A middle-aged Irish woman was very descriptive in pointing me in the right direction: "You have to go straight, go through two lights, make a right into the one way. You want to be careful since the street is narrow and the children are just getting out of school. It might be better to push it up for a few streets. You will see a big monument and it is behind it! The bookstore is right there as well. Just be careful with the heavy traffic!" Just as she had described, I found the shop behind the towering monument at the top of the hill across from the bookstore. With a swift glance, the owner quickly pointed out that the wheel was not correctly aligned on one side. That can apparently happen with a new tire. A simple realignment and some wiggling should do, the owner said. I gave up after at least one hour of wiggling, which ultimately resulted in a punctured tube. At this point, the owner stepped in shaking his head about my attempt to fix it. He offered to change the tube and realign the tire. With no pride left, I accepted his offer and went for lunch. It was almost 3 p.m. and my only regret was that I had run out of time to explore Ennis. I felt hurried to make a few more miles before I had to attend a conference call at 6 p.m. (noon EST). At 5:15 p.m., I wasn’t even close to Doolin. I had 20 miles left and against the wind I was crawling at about 4.5-6/mph. When I arrived at Ennistymon, I passed a house with a huge sign in the window offering 59 euros for dinner, breakfast, room and WIFI. I knocked at the door and a charming lad told me with a smile that they were sold out. He recommended that I stay in Ennistymon at another B&B because it was more of a typical Irish town than the next one over called Lahinch. Ennistymon used to be a thriving market town and a hip and happening place in the earlier part of the 20th century. Back then, it had the highest pub-to-population count in Ireland! Many people have left since the depression and only 13 pubs remain for the town’s 2,000 residents. The old court house was renovated as an artist space with an adjacent gallery sponsored by the Irish government. Walking down the four to five blocks of the main street I noticed a storefront with paintings inside and an artist’s URL on the window. I got curious and learned that Ennistymon has a Rudolf Steiner School, which has been drawing more creative people to the town. On the side street many store fronts were deserted and vacant buildings had “For Sale” signs. A house with the faint outline of its original hotel name painted over in gray was a reminder of more prosperous times. In the town square, there was a traffic sign pointing in the direction of the Ennistymon Chernobyl project. I was tempted to walk over and find the project. There was a stone staircase to the cascades. I was not sure what to expect - cascades may refer to a waterfall. I climbed up the stairs, followed a narrow path down covered by trees that concealed my view. At the end of the path was a muddy, grassy rock platform and the loud sound of gushing water. Hesitant, I stepped onto the rock and mud, worried that I would slip and fall into the forceful water mass. The grass provided enough traction for me to walk and see a huge rock hanging over the river against the warm evening sun. Turning around to look back, I saw the stunning cascades with Ennistymon’s colored houses as its background. Three mules were standing on a big grass field just beyond the rock. I figured it must belong to the Falls River Hotel that towered next to the field. I saw people having dinner in the window and gathered that they must have a magnificent view of the cascades. I headed hungrily in that direction to find some dinner. Who am I in Ireland? I arrived overtired with very little sleep at 6 a.m. in Shannon: a baby was crying non-stop. Glad to exit the plane and the uncomfortable situation, I walked fast out toward the border control while fumbling to find my German passport. The officer, a middle-aged Irishman, looked at me and casually said, " You're on your way to the UK?" I looked back surprised. "No, I am planning to stay in Ireland for my vacation." He handed me back my passport and let me pass without further comment. Was his comment related to my German passport? Was he thrown off that I am, as an Asian, of German nationality or the general fact that I am German? I left the baggage claim with my bike box and went to the Shannon terminal to find a cab to get me to my B&B. It is a very small airport with a few small car rentals and a cab stand. I had imagined that it would be much larger. As soon as I walked outdoors into the early morning sun and the crisp air, I felt back home. The clean streets, small houses and street signs reminded me of the small town I grew up in. Out of habit, I went to the right side of the car and the cab driver joked, "Are you driving?" I wondered how many times per day he would see tourists doing the same thing. "You're from New York? And cycling? What is your route?” the cab-driver asked. “You should go by Clifton and take Sky Road. Most people just turn off there, but it is a beautiful drive out there. We love the Americans. They give a generous tip compared to the Germans!" I decided then and there to travel on my American passport and will only mention that I grew up in Europe if pressed. Feeling a little guilty to be German, I tipped him 30 percent and he made sure to mention that he would love to pick me up. It was overcast and windy when I left in the afternoon to find lunch. The Hunt at New Market Fergus came highly recommended for its fish and chips. Just a mere 3 kilometers away, I started walking along the narrow roads with a still disassembled Jamie. I saw long-missed weeds, flowers, bushes and trees that do not grow in the same abundance in the United States. I knew each by name and remembered the long hours as a kid that I spent in the forest memorizing them. Oddly enough, I really have missed them. At the Pub, a charming place with a fireplace, as well as very narrow tables and chairs, I took the bartender up on his recommendation to visit the castle at the end of the road. A perfect small hike since it was still early in the day. I followed the road past a supermarket when the stone wall appeared on the left. 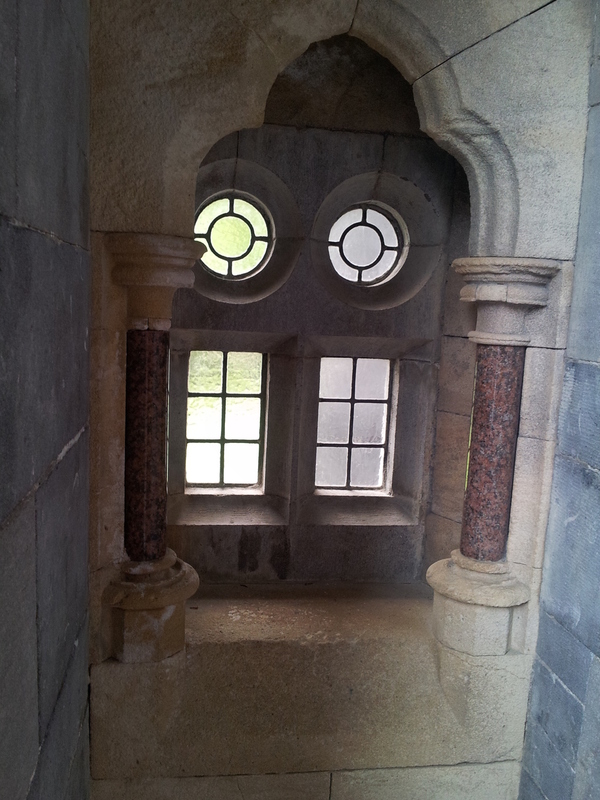 It must have been built in the middle ages. At the crossing, a small brown sign stood up, pointing me in the direction of the castle. The view was just as one would imagine as I climbed up small hills and windy roads with endless green pastures and cows. The sun was out and there were just a few clouds in the sky. I continued for another 3 or 4 kilometers, but never found the castle. Instead, I found a forest area where people settled during the Bronze Age. It has a big sign "Do not enter" and as I was about to pass it a local hiker told me it is safe to enter. "There are just a few fallen trees and in there and about a mile or two might be the castle I am looking for." Since I have come so far another mile seemed not much. I entered the prohibited area and was suddenly in middle of a thick forest with tall trees and a narrow path leading down a hill. There was no one else-I was alone -and it crossed my mind that this might be dangerous as a woman. I brushed off the worry and blamed watching too much Law and Order SVU. I continued until a monstrosity of a fallen tree covered the path. The only way would have been to climb underneath it. At this point I gave up on the mysterious castle and headed back into town for some dinner and WIFI. There is something cathartic about cycling for days by myself. It becomes lonely and very quiet in and around me. The only entertainment is the processing of past experiences, dreaming of my next goals and listening to the random ideas in my mind. The real challenge of touring is not the distance. It is the confrontation of my demons that will emerge in this unscheduled time. The aftermath, though, is worth all the struggle: my mind is refocused and at a still point. I am nervous and excited about the upcoming trip - yearning to reach the still point after another year in New York. It is my first trip touring abroad and I feel under-prepared without cue sheets and a set schedule. The only decisions I have made so far are which regions to visit. I will avoid all of the southern Ireland tourist traps and start in Shannon, making my way to Westport, northeast to Belfast, back south to Dublin and then back to Shannon. Technology: Invasion of Privacy or a potential Life-Saver? I did spend some serious time thinking about how to stay healthy and bicycle safely in a foreign country. If anything happened it would probably be serious. Bicycle accidents are rarely a minor scrape. How would anyone find me on a rural road? Last year I used Google Latitude (Google retired that function) on my phone to track my current locations on my solo tour from New York to Boston. In Ireland I would have different mobile carriers and maybe spotty networks. Does T-Mobile work in Ireland and, if so is it reliable? Hell, in NYC I have dead spots at times on their network. When I checked, T-Mobile confirmed that I have free inclusive data coverage in Ireland with my current plan. It might be as low as 2G, but they said I could upgrade at an additional cost. I could use my phone and install a tracking app. It beats the pricing of the Garmin for $400 and the extra $200 for the worldwide map. Several of my cycling friends confirmed that there was no real advantage to spending the extra money on the Garmin. I finally settled on Life 360 as a tracking app and bought an old-fashioned printed map as a back-up. Technology - best friend or foe? As a tech-dependant person what can I take on the trip that will allow me to remain light-weight (or agile for all my Geek friends)? I think back to the time where a sketch pad seemed enough. Now I am worried about taking a tablet, phone and a computer with me. The tablet is the new laptop replacement. It’s great for anyone on the go who needs lightweight applications. Are tablet apps powerful enough and cover my needs? I am furiously installing apps, downloading books, magazines and music. To run and charge all of my devices - including my Bluetooth headset. I am buying an electricity converter, back-up battery and a USB charger with multiple outlets. It makes me wonder sometimes how efficient all of the technology really is. Another long evening is ahead for me as I test more apps and try to find a solution so that I can avoid carrying the 4-pound laptop with me. I’m getting ready for my third touring trip. I picked Ireland since it has been a dream of mine to ride across the lush green plains: I envision being on a horse, galloping over endless rolling hills and open fields with stone buildings in the far distance. One day that may come true. For now, though, my bicycle must do. I reviewed the different airlines flying to Shannon to find a reasonable rate where the bicycle fee (sporting good) would be either free or just $50 for each leg of the trip. The cheapest deal would have been with Air Canada for $780, which included transporting the bicycle for free (yeah, Canada!). Air Lingus was about $100 more but its rules say the bicycle counts as checked luggage as long as it does not exceed 50 pounds. A big selling point was that the Air Lingus flight was direct and would take only seven hours, versus 22 hours with Air Canada. For my trip to Alaska, I packed Jamie in the bicycle hard case I bought a few years back. It was tough to close the case with all the extra clothing and equipment. On my return from Alaska, I was sitting and putting my full weight on it. The other cyclists were ready to join in when I was finally able to get the case shut and close the straps. I took Jet Blue, which had no weight restrictions and charged $50 per leg. Air Lingus would charge me $100 per leg for the extra weight. My alternative would be to pack her in a cardboard box the manufacturer uses to ship bikes to stores. Most stores typically throw the boxes out, so they are happy give you one for free. Last year I bought Jamie from Bicycle World, a small store down in Bayridge, which is a neighborhood down in Brooklyn. There were numerous reasons why I bought Jamie from Anthony, who is the owner of the store. One reason is that it takes me about 1-1.5 hours by subway or 1 hour cycling for the 15-mile trip. While we were reviewing various bicycles and the differences, Anthony offered to show me how to fix and pack my bike for the tours. It was not part of the sales pitch and his offer came genuinely as part of what he believes in. It touched me. The Jamis Aurora Elite 2013 is not a well-known touring bike like the Surely Long Haul Trucker, but I ultimately settled for Jamie because of her disc brakes. This past Saturday I scheduled a session with Anthony’s mechanic, Juan, to learn how to pack Jamie in a regular cardboard box. April and May are busy seasons and there was a lot of customer turn-around when I arrived in the late afternoon. Regardless how busy they were, Anthony made sure that Juan could take the time to work with me. I snuck to the back of the store where the mechanics were working and slipped underneath the chain with the “Staff Only” sign. I am always a little bit excited to sneak into the back where most customers have no access. Juan lifted Jamie up, clamped her down, and showed me first how to install the front rack for the panniers. After that, he started with the front of the bike. I borrowed his tools to loosen the screws on the back rack and to take the wheels off. As he showed me last year, I released all the air out of the wheels and unmounted the vendors. The other mechanics looked highly amused and started joking, asking when I would start working there. My hands were greasy by now and I didn’t mind. Juan let me know that anytime I pack my bike in a cardboard box, I need to keep the back wheel on. Jamie was wrapped with paddings and cardboard sheets before we lowered her into the box. It seemed huge compared to the much smaller compact hard case. Yet, the box was much lighter. It made me think about possibly selling my hard case to avoid dealing again with the airlines’ weight policies.